Forty nine acres and a spacious home to call your own!! 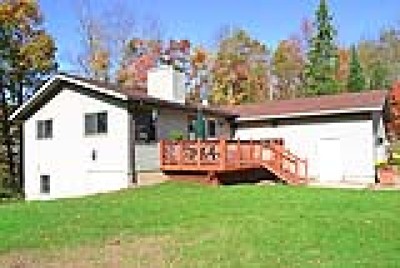 Located east of Chetek and just a stone’s throw from the Potato Lake boat landing, this roomy home is ready and waiting for you. With 4 bedrooms, 3 baths, a great room and a huge family room, there is plenty of space for family, friends and guests. The 49 acres are mainly wooded and teaming with wildlife, but there is a large yard and a roughly 3 acre spot that is fenced and ready for animals. Imagine spending your time in the woods, hunting, 4-wheeling, snowmobiling or just soaking in nature. If you are interested in getting away from the crowded feeling in town, this property is a must see for you. Directions: Chetek, East On County D, Continue North On County F, South (Right) On Public Landing Rd. To Property On Right.